Panic Attacks - How to Treat - Something New Everyday! The symptoms of panic attacks can vary from person to person and chances are you know somebody that has them, or maybe that somebody is you. Symptoms can be a feeling of impending doom or terror, loss of control, heart attack-like symptoms, and some people hyperventilate or feel they're choking or are going to pass out.. Many of these symptoms are those of the instinctual "fight or flight" response that arises in when the mind perceives a dangerous situation. But during a panic attack, there is often no danger at all. Panic attacks may come unexpectedly or during predictable situations such as driving, being in crowds or riding in an elevator. Many people hide the fact that they suffer from panic attacks, but it is important to remember that they are common, survivable and treatable. Though panic attacks can be terrifying, they are not deadly and can be controlled with practice. Any strong or suppressed emotion can trigger a panic attack, so one way to combat them is to deal with fears and feelings as they arise, rather than holding them in. 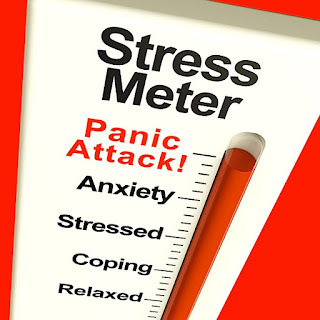 Cognitive behavioral therapy can help eliminate the source of panic attacks by changing the way the brain responds through various calming techniques. When a panic attack comes, accept that it is happening but will pass, and ease yourself through it while remaining as relaxed as possible. If necessary, try to focus on the fact that nothing bad is going to happen to you and that you are not crazy or about to die. 1. Before you get into your car, take time to write about what you are scared of, it is important to reach to root of what is causing your attacks. 2. If you have a cell phone, prepare it with a headset and dial a friend and tell them they don't need to speak to you but you just want them on the line while you are driving, just to know they are there. 3. If you start to panic, take a moment to realize what is happening - you aren't going to die. Breathe deep and take a drink of water. Ground yourself by seeing yourself connected to Mother Earth by a cord coming down through your tailbone into the earth. Have your friend speak to you in a calm manner. Keep an object with you that is grounding such as a rock, crystal, or something else from nature that you can hold or keep in your lap. 4. When you get to your destination, reward yourself. You worked very hard and deserve recognition for stepping into your fear. It can be helpful to view panic attacks as a cue that your body or mind is trying to tell you something about the way you experience stress or negative emotions. Panic attacks can be traumatizing, but they can also be shortened or eliminated over time. The key is controlling your fear rather than letting it control you.